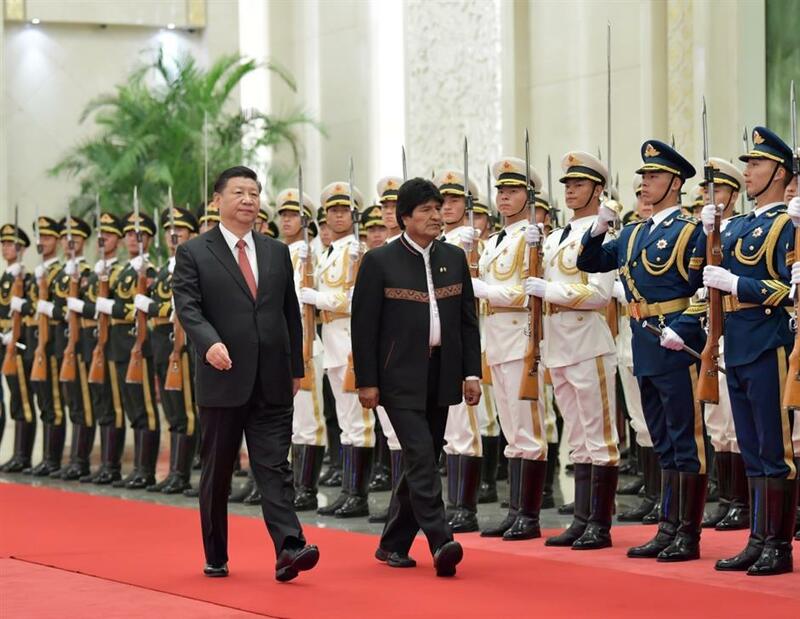 Xi and visiting Bolivian President Morales agreed on Tuesday that the two countries would establish a strategic partnership to promote greater development of bilateral relations. Chinese President Xi Jinping (L) hosts a welcoming ceremony for Bolivian President Juan Evo Morales Ayma at the Great Hall of the People in Beijing, capital of China, on June 19, 2018. Xi Jinping held talks with Juan Evo Morales Ayma on Tuesday. 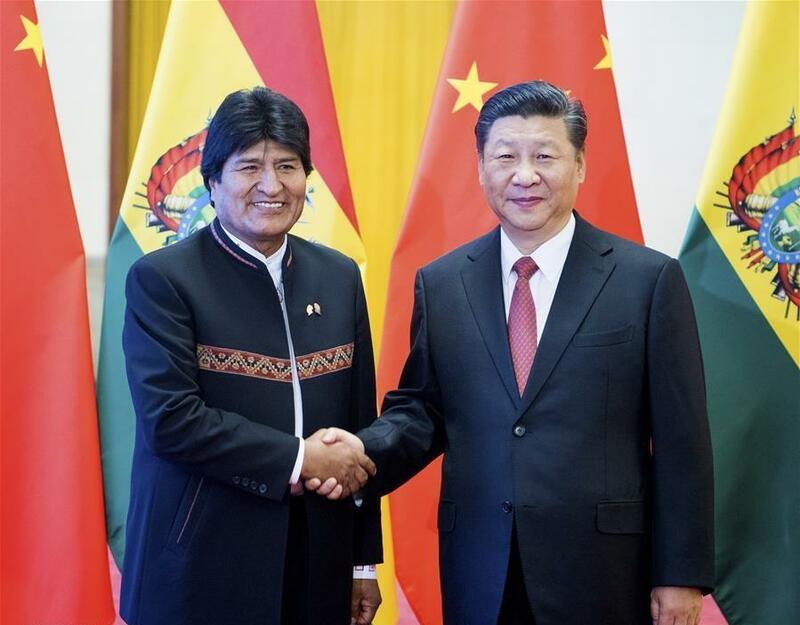 Chinese President Xi Jinping and visiting Bolivian President Juan Evo Morales Ayma agreed on Tuesday that the two countries would establish a strategic partnership to promote greater development of bilateral relations. Xi pointed out that since the establishment of diplomatic relations between China and Bolivia 33 years ago, their relations have continued to steadily develop and are currently the best they've ever been. China appreciates that Bolivia firmly adheres to the one-China policy, actively responds to the Belt and Road Initiative, and vigorously promotes the deepening of China-Latin America relations, said Xi. "We are willing to work with Bolivia to take establishing a strategic partnership between the two countries as an important opportunity to continuously deepen exchanges and cooperation in various fields, push bilateral relations to a new level and open up new prospects," Xi said. Xi stressed that China and Bolivia should be friendly partners of political mutual trust, firmly support each other on issues involving core interests and major concerns of both countries, and strengthen exchanges at all levels and in all fields. He said that the two countries should become development partners focusing on pragmatic cooperation, synergize development strategies within the Belt and Road framework, and jointly create a new model for cooperation in investment, trade and services. The Chinese side is open to importing more Bolivian farm and ranch products, he added. Both China and Bolivia are countries with ancient civilizations, said Xi, calling for mutual learning between the two countries and exploring the use of ancestral wisdom to better deal with today's problems. Xi suggested the two countries become strategic partners of multilateral coordination and continue to coordinate positions on United Nations affairs as well as major international issues such as sustainable development and climate change. He called on the two sides to jointly safeguard the legitimate rights and interests of developing countries, build a new type of international relationship featuring mutual respect, fairness, justice and win-win cooperation and join hands in building a community of shared future for mankind. Chinese President Xi Jinping (R) shakes hands with Bolivian President Juan Evo Morales Ayma during a welcoming ceremony at the Great Hall of the People in Beijing, capital of China, on June 19, 2018. Xi Jinping held talks with Juan Evo Morales Ayma on Tuesday. For his part, Morales said the Bolivian people are deeply impressed by China, admire China's development concept and achievements, and highly commend China's contribution to world peace and development and the building of a harmonious human society. "China's support and aid to Bolivia's economic and social development never attaches any political conditions," said Morales, adding that Bolivia trusts China and expects a closer strategic partnership in the future. He said Bolivia hopes to jointly build the Belt and Road and to strengthen practical cooperation in various fields with China, so as to promote China-Latin America cooperation and make greater contributions to world peace, development, fairness and justice. Xi said that the essence of China-Latin America cooperation is South-South cooperation, featuring mutual aid and support, complementary advantages, and cooperation with win-win results. He said China has always worked with the Latin American countries in line with the principle of equality, mutual benefit and common development, and the Belt and Road Initiative has provided a new platform for China-Latin America cooperation. "China stands ready to work with Bolivia to push for sustainable and steady development of the China-Latin America comprehensive partnership of cooperation," Xi said. After the talks, the two heads of state signed a joint statement on establishing the strategic partnership between the two countries and witnessed signing of documents on jointly building the Belt and Road, and cooperation in other fields. Prior to the talks, Xi held a welcome ceremony for Morales at the North Hall of the Great Hall of the People.